In spiritual circles, it’s often suggested that the human race is in the process of a collective spiritual awakening. One of my aims in writing my new book The Leap was to investigate the evidence for this. Is it really true that we’re in the process of ‘waking up’ as a species? Let me first of all explain what I mean by ‘enlightenment’ or (as I prefer to call it) ‘wakefulness.’ I think of it as a shift into a more expansive, higher-functioning state in which we experience a strong sense of connection with the world around us and other beings, a sense of inner quietness and spaciousness, and a heightened awareness of our surroundings. It’s a state in which we transcend identification with the ego-mind, and let go of much of the anxiety and restless which afflicts us in our normal state. First of all, wakefulness seems to be natural for a small minority of people. These people aren’t awake due to a sudden transformation, or as a result of decades of regular spiritual practice – wakefulness is simply their normal, natural state. Such people don’t usually become known in a spiritual context. Instead they often become creative artists, poets or painters, like Walt Whitman or William Wordsworth. Or perhaps they become idealists or social reformers, motivated by compassion or a desire to alleviate suffering, like Florence Nightingale, or Peace Pilgrim. As I showed in my earlier book, Waking from Sleep, it’s very common for people to have temporary glimpses of the wakeful state, when they’re inactive and relaxed, and their minds become quiet and calm. For a few moments, the wakeful state emerges, like the sun from behind a wall of clouds. This suggests that our normal sleep state has only a loose hold over us and can easily dissolve away, even if it usually manages to reestablish itself. As I showed in my book Out of the Darkness, it’s not uncommon for people who go through intense stress and turmoil – perhaps linked to bereavement, a diagnosis or cancer, alcoholism or depression – to undergo a sudden shift into wakefulness. This often occurs when they have reached ‘rock bottom’, at the point when they think they have lost everything. Their previous identity seems to dissolve away, and a new ‘wakeful’ identity suddenly emerges to replace it, like a butterfly emerging from a chrysalis. For the ‘shifters’ — as I called them in Out of the Darkness — who undergo awakening in this way, the wakeful state seems to emerge fully formed, as if it had been latent inside them, waiting for the possibility to unfold. Although there are sometimes periods of confusion and disturbance as the old ‘sleep’ state fades away and the new one establishes itself, the process seems natural and inevitable. And again, this suggests that the wakeful state is ready to emerge within our collective psyche. It is already there, fully formed and integrated, but only able to emerge (at least for some people) when the old sleep state dissolves away. It’s important to remember that our own individual psyche is connected to — and influences — our species as a whole. When we undergo awakening as individuals, we contribute to the awakening of our whole species. Our own leap is part of the leap of our whole species. As more and more of us move toward wakefulness, the easier it becomes for others to do the same. The blueprint of the wakeful state builds up within our collective psyche until eventually it may replace sleep as the normal state that all human beings naturally develop in adulthood. The universe wants us to wake up and will guide us toward wakefulness, if we create the right conditions – until eventually wakefulness becomes normal for the whole of the human race. 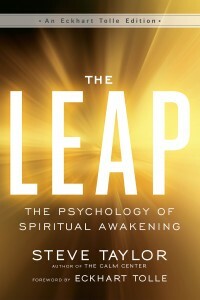 Based on the book The Leap: The Psychology of Spiritual Awakening. Copyright © 2017 by Steve Taylor. Printed with permission from New World Library — www.newworldlibrary.com. Steve Taylor’s previous books include The Calm Center, Out of the Darkness, and Waking from Sleep. A senior lecturer in psychology at Leeds Beckett University and one of Mind, Body, Spirit magazine’s “100 Most Spiritually Influential People,” he lives in Manchester, England. His website is www.StevenMTaylor.com.